The Ouachita Mountains immediately west of Highway 7 contain several places to paddle canoes and kayaks. 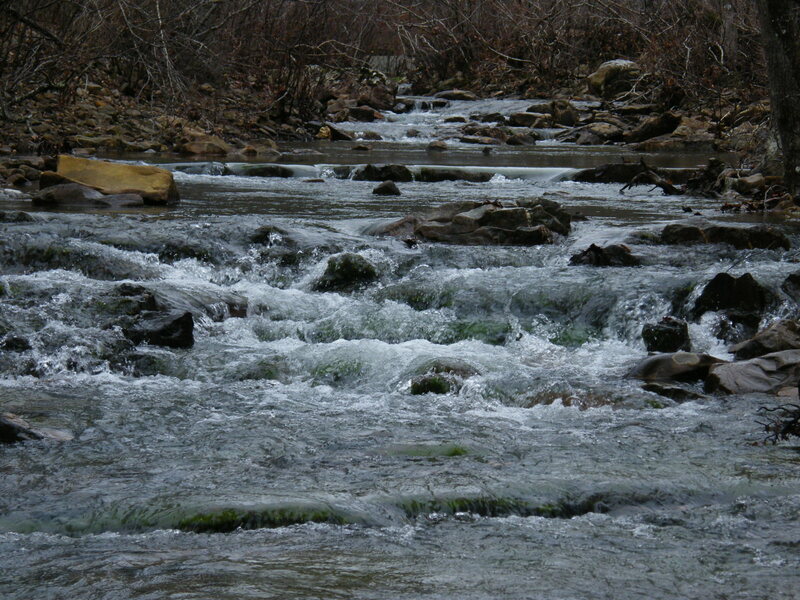 My past impression of creeks in this region was that they contained too much brush growing in the channel for paddling; however, where creeks run north or south through the east-west ridges of the Ouachitas, lots of bedrock is exposed and brush isn’t able to choke the streams. Brush Creek is aptly named for much of its length, but when the creek heads south and passes through a ridge, the channel is open enough for some Class II fun. Only 0.7 miles of the creek fit this description, but the access is easy and the fun factor is high. 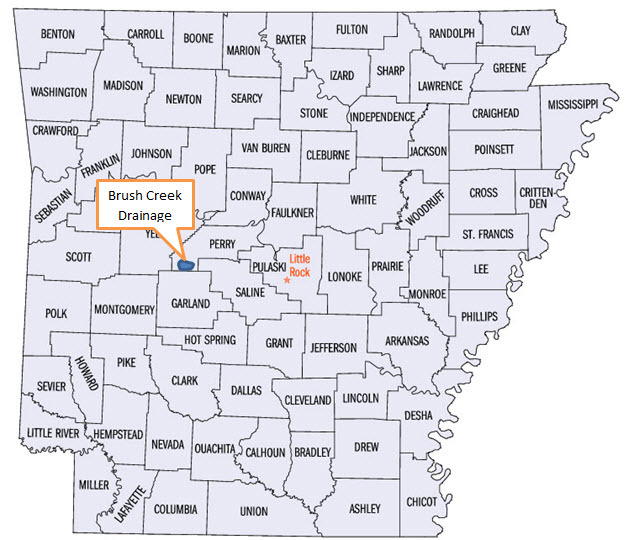 To get to this particular Brush Creek (many creeks in Arkansas are named Brush Creek), you can travel west from Highway 7 on the Forest Service Autotour route. This gravel road is passable even after a good rain. 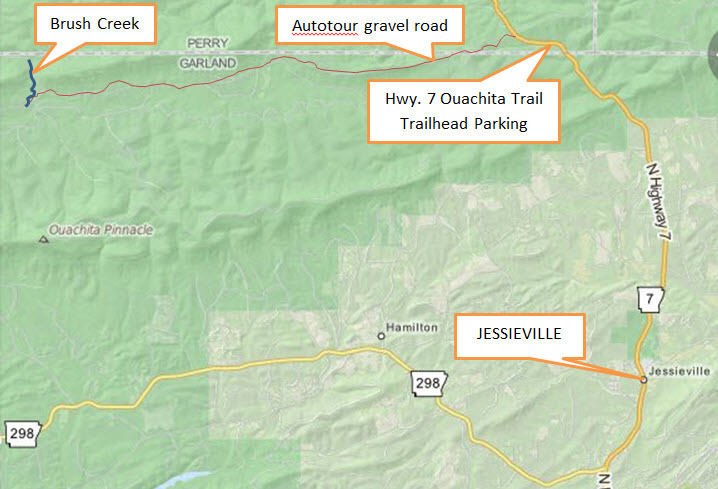 The Autotour route intersects Highway 7 at the top of the mountain, about one half mile north of the Ouachita Trail Hwy. 7 Trailhead parking lot (a good place to meet your paddling buddies). Head west on the Autotour. There are signs along the route at a lot of the many intersections to keep you on the Tour. At unmarked intersections stay on the main road and keep heading west. It is 8.4 miles from Highway 7 to the Brush Creek bridge, the first bridge you cross. It is high above the creek, about a hundred feet long and has railings along each side. You can’t miss it, but don’t cross it; the take-out is a drive-in area on the right between the road and the creek. The put-in is reached by driving back up the hill about a quarter mile and turning north on Forest Service Road 11A (Oxtail Road) that you passed before descending down to the take-out. Follow this road until you come to the low water slab crossing; that’s the put-in. The water should be shallow enough for you to be able to drive across the bridge in order to have a safe run. Measure the water depth next to the curb over the center pipe of the three pipes that pass through the bridge. Six inches running over the bridge is a suggested minimum, though you can probably scrape through (and bounce off a lot of boulders) when the water is a little lower. Between six and nine inches of depth will offer the easiest passage over the rocks and still offer a fun outing. The best parking is across the bridge where the easiest launching is, too, using the branch of the creek that comes in from the west. Below is a link to a video from a run down the creek when the water depth at the curb was 6″. The drainage area for the creek is shown on the map below. The drainage area is relatively large at 5 square miles so this creek will take less rain than some others to rise to a runnable level; I’ll guess that from three quarters to an inch would suffice.